This is more technique than recipe and is one of those that can be endlessly adapted and is a good template. Make it more or less soupy. Add kale or other greens or use more onion if you don’t have leeks. Change the ratio of vegetables to beans. Use bacon instead of sausage or leftover chicken or no meat at all. The beans are creamy and rich on their own. Add spices, maybe chili flakes or cumin and coriander. In a large skillet or dutch oven heat the olive oil over medium high heat. Add the onion, leeks, sausage and herbs and a couple of pinches of salt. Stir well and sauté for several minutes, then cover the pan and turn down to medium and cook for about 10 minutes until the leeks have softened. 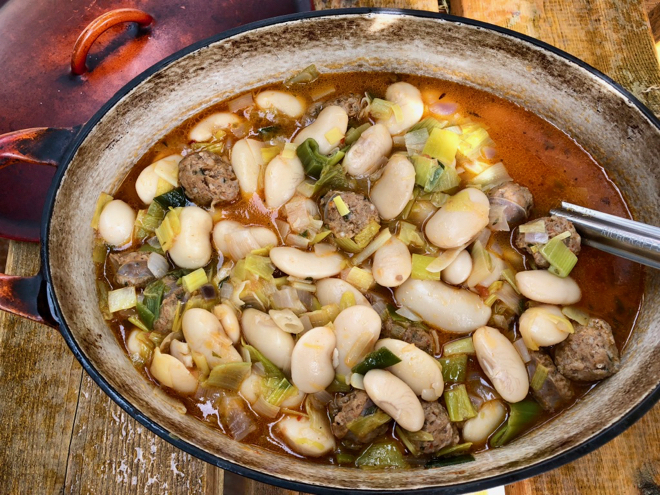 Stir in the beans and cooking liquid or broth simmer for 5 minutes to marry the flavors. Season with freshly ground black pepper and add salt if needed. Serve with another drizzle of good olive oil and good, crusty bread.